Dr. Vibert White Ph.D. Speaks On The National Leadership Coalition's Open Letter To The Black Community! 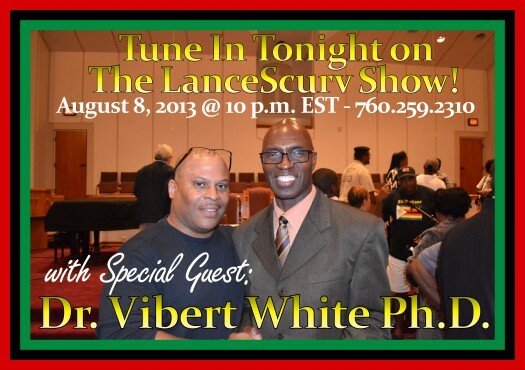 Tonight on The LanceScurv Show we go in depth with the University of Central Florida’s Dr. Vibert White Ph.D. on the recently circulated Open Letter To The Black Community by The National Leadership Coalition. DR. White is going to speak on the strategies necessary to command the respect of the big corporations that take our money for granted as they become even more wealthy without giving back to the Black Community. Be prepared for a very thorough conversation riddled with the historic facts that confirm that the here and now is critical to take the actions necessary to revive an ailing community that is suffering regardless as to how many high paid entertainers and athletes seem to be making it big. Modern day slavery is returning as an ever increasing amount of prisons are being built as the laws get even tighter to keep Black men filling them indefinitely. It’s time to hear some common sense and to get ready to utilize all of our resources to make the change that these compromised politicians only mention in their repetitive jingles and slogans to seduce you for your vote! Don’t miss this rare opportunity to hear what the mainstream media doesn’t want you to be exposed to! The battle for your mind and consciousness continues and we will win as we wake up the sleeping giant tonight for sure! Previous : The National Leadership Coalition Open Letter to the Black Community – Please Share!!!! Next : Black People Are Their Own Worse Enemies!